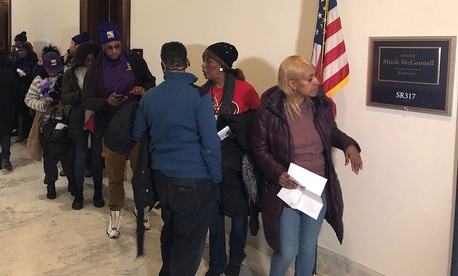 “You went to the right place,” Sen. Chris Van Hollen, D-Md., told about two dozen out-of-work agency support services contractors on Wednesday just hours after they lined up at the doorway of Senate Majority Leader Mitch McConnell’s office. Clutching stacks of unpaid household bills, the locked-out employees organized by the Service Employees International Union took turns entering the reception area of the Kentucky Republican’s personal office and asking that he end the partial government shutdown. Though McConnell himself was at the Senate chamber, his staffers calmly took down names and promised to relay the protesters’ message, according to the workers. But the staff declined to accept responsibility for the bills carried in by anguished cafeteria, cleaning and building security workers assigned to various Smithsonian museums, the National Archives, and the State, Agriculture and Homeland Security departments. “McConnell is the one who could open the government tomorrow,” said an official of SEIU’s local 32BJ. Unlike federal employees, who are guaranteed back pay after the shutdown due to a bill Congress passed last week and President Trump signed Wednesday, these agency-based employees of private firms simply go without paychecks for the days missed when agencies close. “Mr. Trump, please stop it,” said Smithsonian contract employee Faye Smith, who teared up as she told Government Executive of the frustrations of applying for food stamps and unemployment insurance in her home state of Maryland. “My rent is due, and I’m in the Second Chance [rent credit program], so if I’m late I’ll be evicted,” she said. Efforts to find a temporary job frustrate the 60-year-old because, she suspects, of age discrimination. That same morning, McConnell on the floor of the Senate blamed Democrats for the shutdown, accusing them of political games and noting that “federal employees are stretching every dollar” to get by. Yvette Hicks, an employee of Allied Universal Security who normally would be at her guard post at the closed National Air and Space Museum, said she is raising children as a single mother. Two of them require use of asthma breathing machines every four hours, and her electric bill is due. “Mr. McConnell, I can’t pay my bills until you shut this furlough down,” she told a reporter. The demonstration at McConnell’s office was peaceful, though eight Capitol Police officers looked on, and a staffer from the Senate press gallery was there to herd camera crews to keep the hallway passable. A House bill that would guarantee pay for such contract service employees was reintroduced in the current Congress by Del. Eleanor Holmes Norton, D-D.C., and a Senate version was rolled out on Wednesday afternoon by Sen. Tina Smith, D-Minn. Smith, Van Hollen and Sen. Ben Cardin, D-Md., announced the bill during a Wednesday afternoon panel discussion in which they heard from the same SEIU-led locked-out employees. Smith’s Fair Compensation for Low-Wage Contractor Employees Act would build on an existing process for handling shutdowns to pay back contractors for the costs of providing back pay to low-wage service employees who have been furloughed or laid off. “Some contractors have forced workers to use their annual leave during the shutdown, so the bill would compensate contractors for restoring annual leave as well,” Smith said. The gathered employees, many of whom took selfies with senators whose names they were just getting to know, described how many of them work multiple jobs, including driving for Uber. Tamela Williams, who has worked two jobs at the Smithsonian and the State Department, stressed that they all want to work. “I’m a workaholic, nota sit-at-home-aholic,” she said. With some speaking in Spanish through a translator, they thanked the Democrats who spent time with them. “We see you guys trying, and it gives me hope,” said Faye Smith.